Mile 48.4 Sterling Hwy - Landing is directly downstream of the Kenai River Bridge. Take the first access road south/downstream of the bridge to the parking area. Alaska State Parks daily parking fee required. 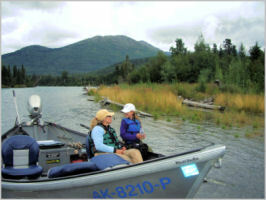 Mile 55 Sterling Hwy - The landing is located approximately 7 miles downstream from the Kenai River bridge / Cooper Landing Boat Launch. The boat landing and parking lot is visible on the riverside of the highway. Turn left of the tollbooth for the boat Landing. The Russian River Ferry is downstream and straight ahead of the tollbooth entrance. Both day and overnight parking is available for a fee. Mile 58 Sterling Hwy – Turn on Skilak Lake Loop Road (East Junction) and take the first left (.1 mile). The access road takes you right to the river. There is a very small signpost for Jim’s Landing. 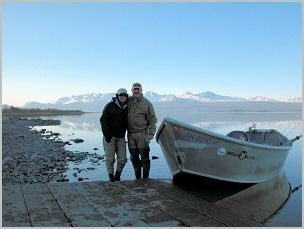 Skilak Road is a gravel surface loop off the Sterling Hwy in the Kenai National Wildlife Refuge. The East Access is from mile 58 Sterling Hwy and the West Access is from Mile 75.2. Skilak Loop Road provides access to several campgrounds and lakes including the Upper Skilak Landing and the Lower Skilak Landing. 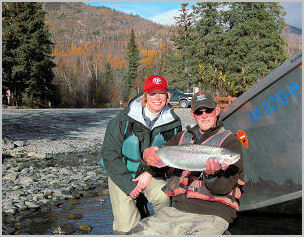 Upper Skilak Landing is the take-out point for trips coming down through the Kenai Canyon. Lower Skilak is the put-in for trips heading down the Middle Kenai toward Bing's Landing. Follow the gravel road to the parking area and pay daily fee.